Rabbit. 8x8, oil on linen mounted on panel. 2017. Painting small is hard, right? In recent years, I've had a tendency to reach for a painting knife every time I've worked on a small landscape painting. It's a good way to get something down fast without getting bogged down by detail. It forces you to work in big shapes, only suggest at details, and often results in a thick, textured paint layer. Yet I've never been tempted to take that approach with animal paintings. I prefer my portraits done with a brush. In this case, working out from the eye, I used ever larger brushes to cover the canvas. The sizes ranged from no.2 Rosemary series 279 around the eye to no.8 bristle flat in the background. Most of the painting techniques I've used here are textbook standard. 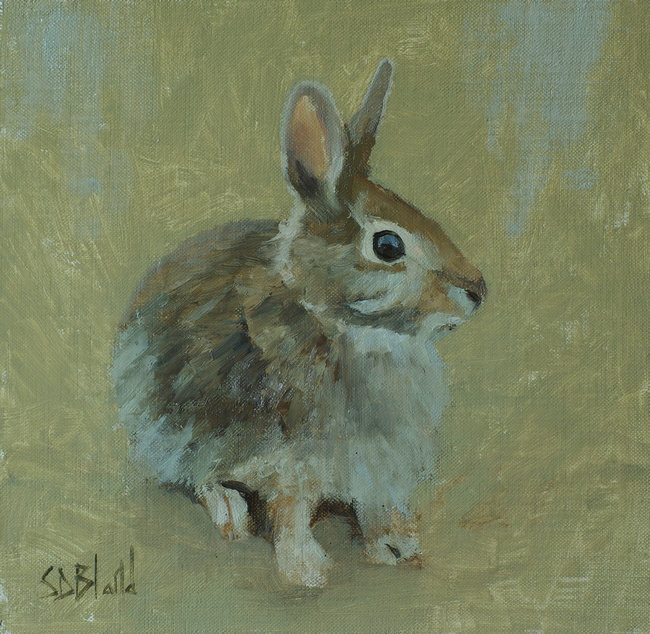 This gives a soft, fluid edge without the need to work it over with a tiny brush - it's so effective that I use it for most animal paintings and portraits. This method of painting the eye (and other facial features like lips) was a staple of John Singer Sargent. It's the best way to keep the features fluid. It forces working from big shapes to smaller ones. Wet in wet. In general, animal faces are easier to paint than human ones. You can often get away with leaving holes for the eyes and filling them in later, but you always end up having to worry about those edges.